The cruiser HMS Manchester which was attacked by Italian torpedo-bombers en route from Gibraltar to Malta with soldiers of the 8th Battalion on board on 23rd July 1941. 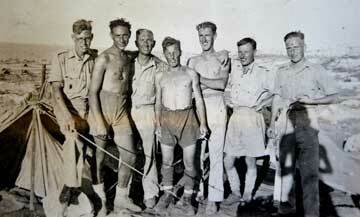 A number of the crew and five officers and seven men of the battalion were killed. The dead are commemorated on the Brookwood Memorial. The battalion resumed its journey to Malta on the cruisers HMS Hermione and Arethusa and the minelayer HMS Manxman on 1st August 1941. 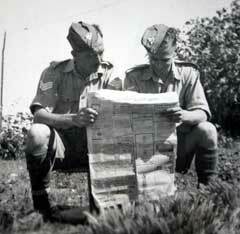 Officers of the 8th Battalion, Malta, 1941. 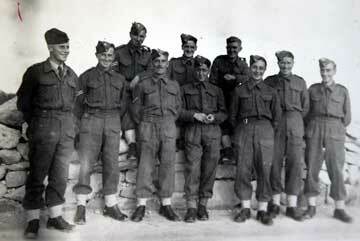 Left to right, back row, Lt Sharpe, 2nd Lt Grimes, Captain Mills, Lt Thornton, 2nd Lt Chater, Captain Rhodes, 2nd Lt Radcliffe, 2nd Lt Johnson, Lt Beesley, Lt Keith-Robinson. Middle row: Captain MacDonald, 2nd Lt Freeman, Lt Turner, Lt Stephenson, Lt Brigden, 2nd Lt Drewery, 2nd Lt Dullender, Captain Griffiths (Medical Officer), Lt Brady, Captain Warren, Lt Davenport. Front row: Captain Stewart, Major Morrison, Major Stanton, Lt Coates (Quartermaster), Captain Clemence (Adjutant), Lt Colonel Westropp (Commanding Officer), Major Davidson (Second in Command), Major Huntington, Captain Garnett, Captain Martin. Absent Lt Brooker. 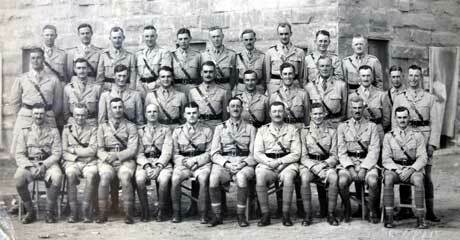 Senior Non-commissioned Officers and Warrant Officers of the 8th Battalion in Malta in 1941/42. Lt Colonel Westropp is pictured in the dark forage cap in the centre, to the right of him is Regimental Sergeant Major Domini. 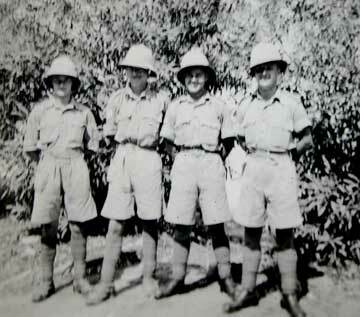 Four soldiers of the battalion soon after arrival on Malta in the summer of 1941. The topees were discarded and the turn-up shorts were cut down shortly afterwards! Headquarter Company signallers waiting for the next raid with binoculars at the ready. 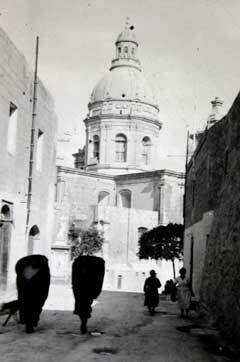 Malta 1942. 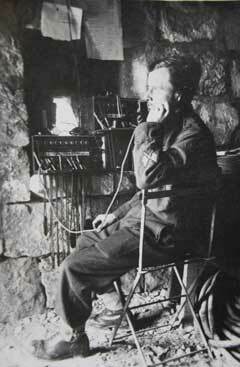 More signallers, sorting out the cable. Signallers ready for the off from Ta Salvatur, 1942. 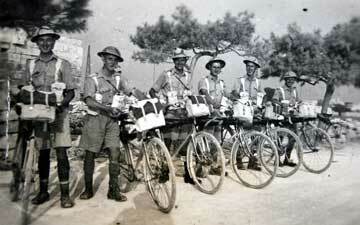 The cycle was the only transport due to the shortage of petrol on Malta during the siege. 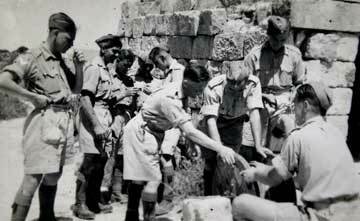 Note the steel helmets and the stone wall camouflage. 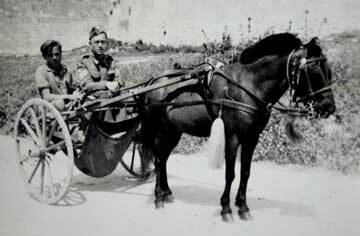 Rations were transported by CQMS Rothblatt in this horse drawn cart due to the short of fuel. 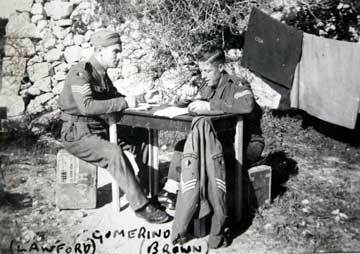 Malta 1942. Soldiers writing home. 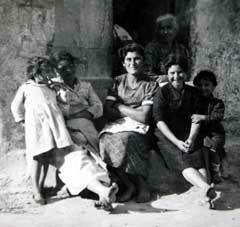 Ta Salvatur, Malta, 1942. The local newspaper has arrived from England. Four signallers of Headquarters Company, 8th Battalion. Entertainment is from Bill Hallett on his clarinet. Malta 1941. 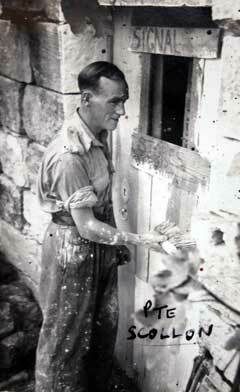 Private Scollon, signal storeman of the 8th Battalion, at work with the white wash brush. 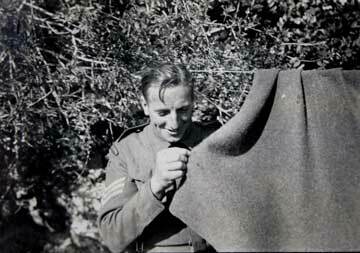 Private Scholes on exchange duty at Ta Salvatur, 1941. Sergeant Philip Fordham, who was later to win the Distinguished Conduct Medal in Italy, and Privates Tunstall and Scholes using cut down petrol cans for ablutions at Ta Salvatur, 1942. 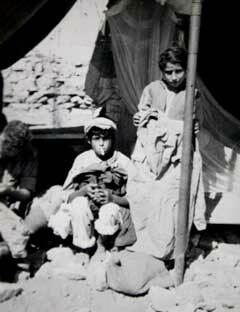 'Dhobi' kids, who assisted with the washing of soldiers clothes. Ta Salvatur, Malta, 1941. 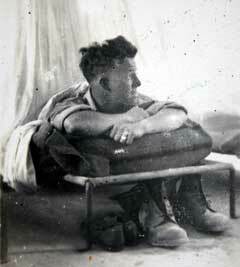 Sergeant Egner emerging from his sand fly tent over his bed. 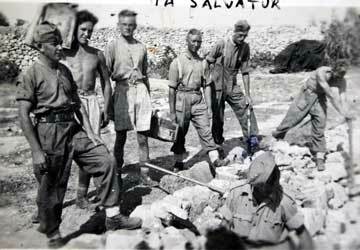 Ta Salvatur, Malta, 1942. 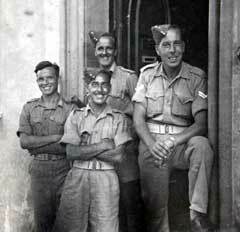 Four soldiers outside the leave hostel at Valetta, 1943. 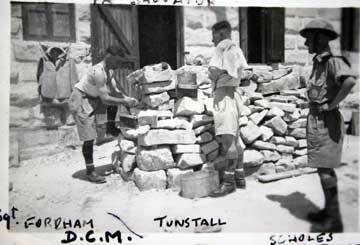 Construction of a blast wall, Ta Salvatur, Malta, 1942. 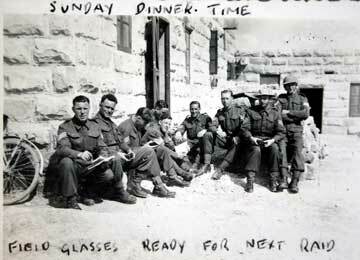 Soldiers on the range at St. Andrews, Malta, 1943. 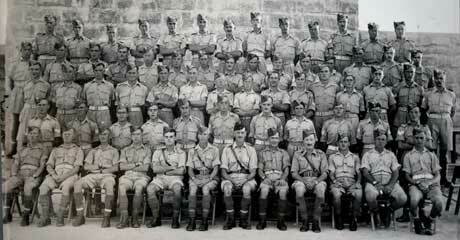 Signal training squad of the 8th Battalion, Malta, 1943. 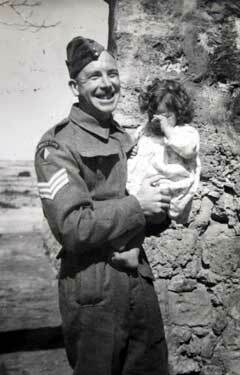 Sergeant H Shaw with a reluctant Maltese child, on Malta in 1943. 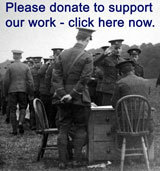 Mr Shaw donated his snap shots of service on the island to the museum and provide the only record of the battalion's time there. 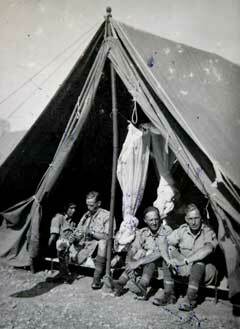 The 8th Battalion rear party on Malta during the move to Palestine in 1943. 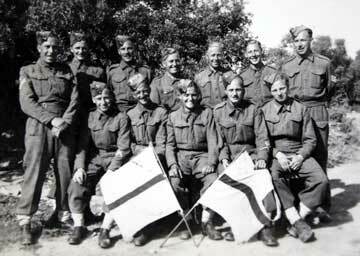 In 1944 the 8th Battalion and 1st Battalions of the King's Own merged and were designated 1st Battalion King's Own and served in Italy in 1944-45 with the 10th Indian Division. A Maltese village street with typical church dome.